I was very happy to hear the news of new bike lanes along Hunter Street, which have been mooted for some time. There will be two one way lanes, one on either side of Hunter Street. This will be different from the bike lanes I have ridden in Sydney, which were often two way, presenting some problems when making turns. As Newcastle locals are all aware, Hunter Street needs “revitalising”, and this term has become the catchcry of many when talking about the needs of the main street of Newcastle. However, Hunter Street has been quietly reinventing itself while the larger decisions about its future are not being made, and there is now a thriving and growing series of businesses and meeting places springing up along the street, largely facilitated by Renew Newcastle, and creating a nice inner city vibe. Many of the locals involved in this change ride bikes, but Hunter Street is nevertheless a dangerous spot to cycle, which is why I have so few photos taken there. 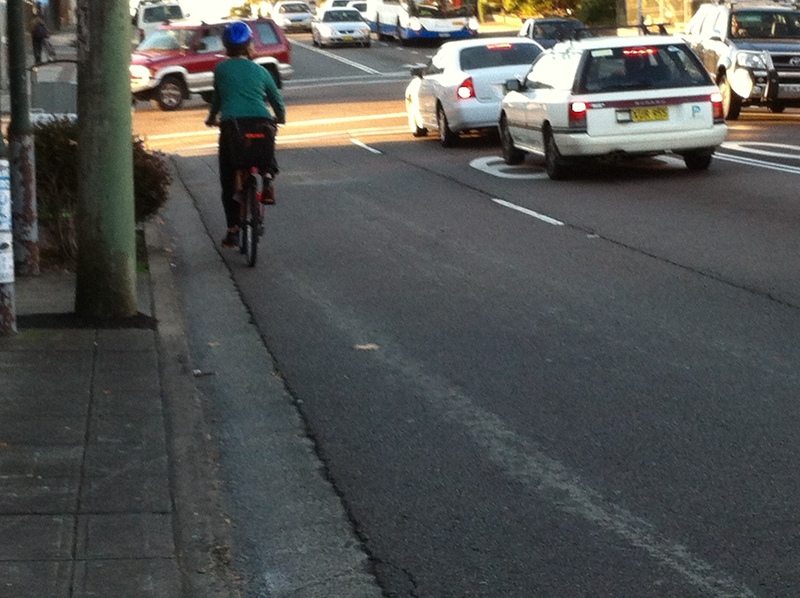 Usually when I am cycling along Hunter St I am in fear for my life! 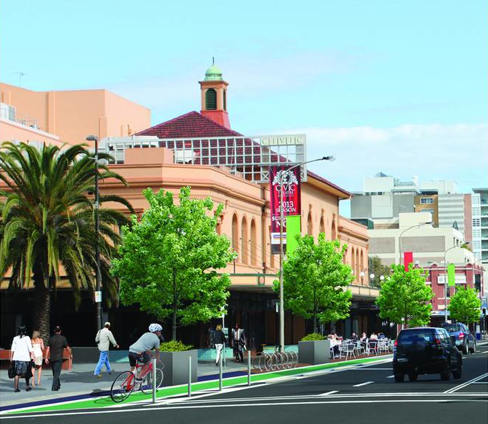 The artist’s impression above, published in The Herald, presents an idyllic impression of Hunter St once it will be remodelled. There will be “parklets” dotted along it … nice! This photo shows what it is like now for cyclists: The last two times I cycled along Hunter Street, this could have been me. Each time I was passed extremely closely, once by a bus, it was extremely unpleasant and I won’t cycle there now. The new cycle lanes will be a great move, hopefully they will encourage many motorists to switch to cycling, easing the traffic and parking congestion there. This entry was posted in Uncategorized and tagged bike commuting, infrastructure, newcastle, newcastle bike tracks, women on bikes. Bookmark the permalink.